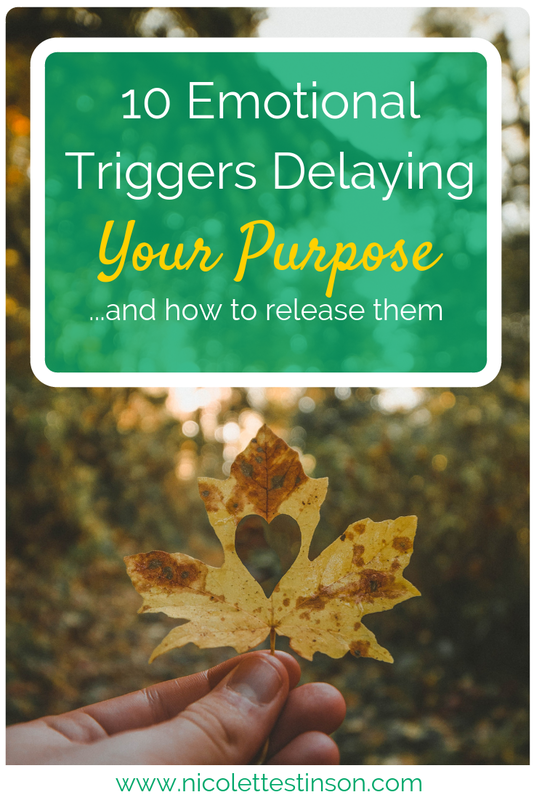 One of the least discussed but most powerful ways to align with your true purpose is to identify and release the emotional triggers that are slowing you down and guiding you off course. An emotional trigger is essentially a strong, often negative emotional response. These triggers can happen anywhere at anytime and anything can can activate a trigger, it’s unique to each individual and their circumstances. The challenge is that you may possibly be so identified with your emotional triggers that you are either blind to them or possibly even righteously clinging to them even as they hinder you. Emotional Triggers keep us from being productive and doing the work we are meant to do in the world....a.k.a our purpose. When you’re working towards a meaningful purpose emotional triggers are bound to arise. The opportunity is to catch yourself, let it go and focus back on your vision. So how exactly do these insidious triggers show up and how do you identify and release them and get on with your true path and purpose? All of the above emotional triggers keep us repeating patterns over and over if we don’t heal them. This may seem like common sense but so often people do not do what is necessary to heal these triggers. Healing, in this sense, simply means gaining awareness and adopting a stable mind, which helps you create consistent action and abundance. First you must believe this process is worth doing. You must believe that if you give up the emotional trigger you can get what you want. If you think you are right about the triggers or that you are going to get love or attention from them this will keep you from believing and changing. It’s vital to first believe that releasing the trigger will actually move you towards your true vision and purpose. Look at the list of emotional triggers above and think about an area of your life where you are emotionally charged or having a breakdown in some way- maybe a place you are not so proud about the way you are being or reacting. Can you see where you are responsible for the “drama” of this reaction? When you’re victim to the drama of an emotional trigger it becomes easy to want someone else to take care of it or fix the issue at hand but you can’t outsource your purpose. Define the breakdown and own your responsibility. If you find yourself judging yourself or others about the area of life you defined, make a decision to replace judgement with curiosity about the emotional trigger itself. If you believe you are wrong for feeling the trigger or something outside yourself is wrong for creating it, you will miss the opportunity to learn and grow. The emotional trigger is where your life is trying to grow. You can use your response as a compass for growth, which the human spirit is innately attracted to. The emotional trigger is giving you a window into something amazing that wants to come through! Let it go and focus back on your vision. Releasing the trigger gives you control, as you lean into growth. Keep enrolling yourself back into the belief that when you let go of the trigger you align back with purpose. Ask yourself what you’d have to give up so that you don’t experience this trigger again? Then actually give that thing up. Let it go and allow yourself to receive what’s next for you. There is always going to be a sacrifice on the path of purpose. Learn to sacrifice the thoughts that are keeping you small, preventing you from moving forward and delaying your true purpose. Becoming a master at quickly identifying and releasing emotional triggers is one of the most important skills you can cultivate on your path to creating true and meaningful purpose in all you do. Release the emotional triggers that are holding you back from your true potential, from your purpose and from staying in service. As soon as you do, you will get more of what you truly desire. What are you committed to releasing today?